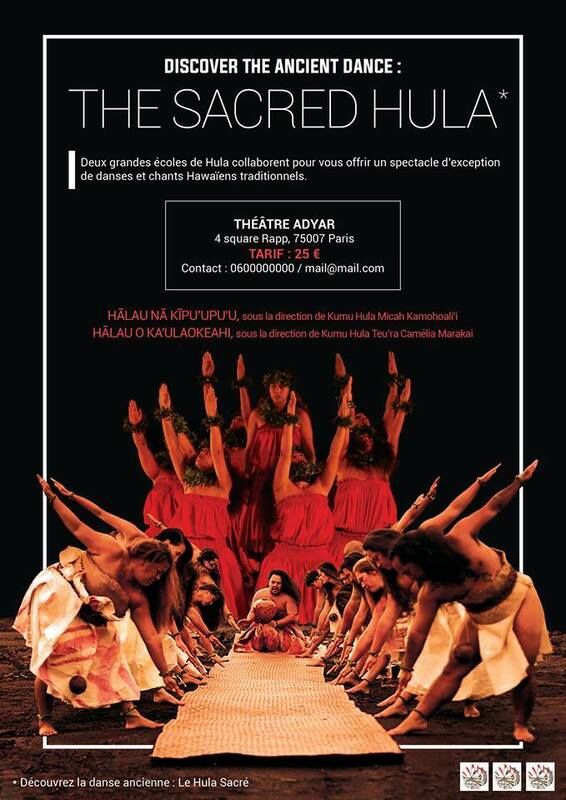 Kumu Micah Kamohoalii van de Pele clan , Kumu Hula van Halau Na Kipuʻupuʻu in Hawai'i en ook specialist in de kunst van het Kapa , zal een unieke workshop in Amsterdam geven op donderdag 13 november zal plaatsvinden in het Amsterdam Dance Centre studio Bellamystraat 51 , ​​1053 BG Amsterdam , Nederland . Twee sessies zullen worden aangeboden : van 10 uur tot 12 uur : kahiko ( oude dans ) - van 13:30 u tot 15:30 u: ' Auana ( moderne dans ) 1 sessie : € 50; 2 sessies : € 80 tot dit eerste bezoek aan Amsterdam te eren , zal Kumu Micha studenten voorstellen choreografie op het thema van ali'i die naar Europa ging . Wij zeggen niet meer in dit stadium , zul je de verrassing in de live ! Plaatsen zijn beperkt ; alle items opnieuw moet worden gedaan door de halau website : bezoek de events pagina om te registreren: www.halaunakipuupuu.org of e nakipuupuu@gmail.com voor meer informatie. 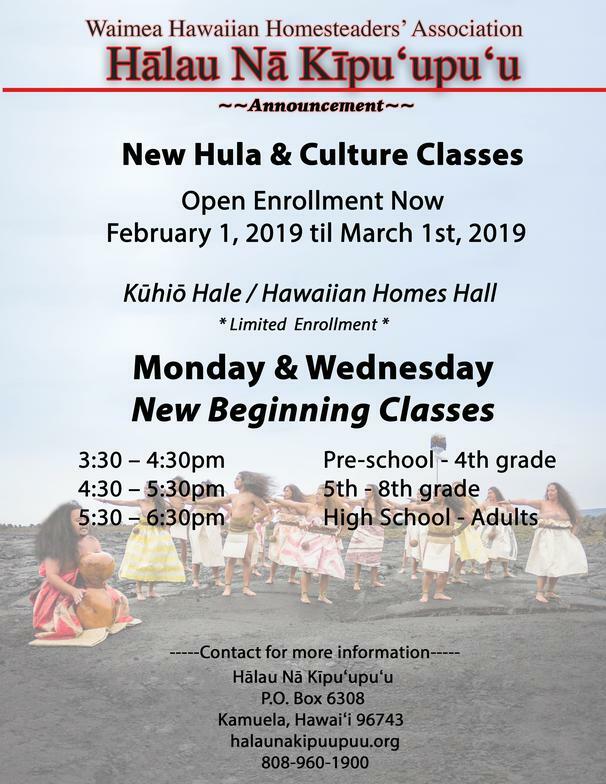 Hulilaualiʻi Hula Drama will allow the audience to take a journey through time and experience the rich history of ancient Waimea, itʻs sacred lands, chiefs, and people. " Ka Hulalaualiʻi O Waimea" meaning "The royal calabash of Waimea" referring to the immense population of royalty residing in the area. From the Mountain of Wakea to the Platforms of Hoʻopiliahae, from the birth of the chiefs in the sacred hills of Waimea to the conquering of the islands, from the mystical forests of Mahiki to the heated plains of Puʻukawaiwai. “Born is the chief!” King Kamehameha I united the Hawaiian Islands into one royal kingdom after years of conflict. This hula drama will take the viewers into old Hawaiʻi and show the importance of perpetuation and persistence of our native heritage. 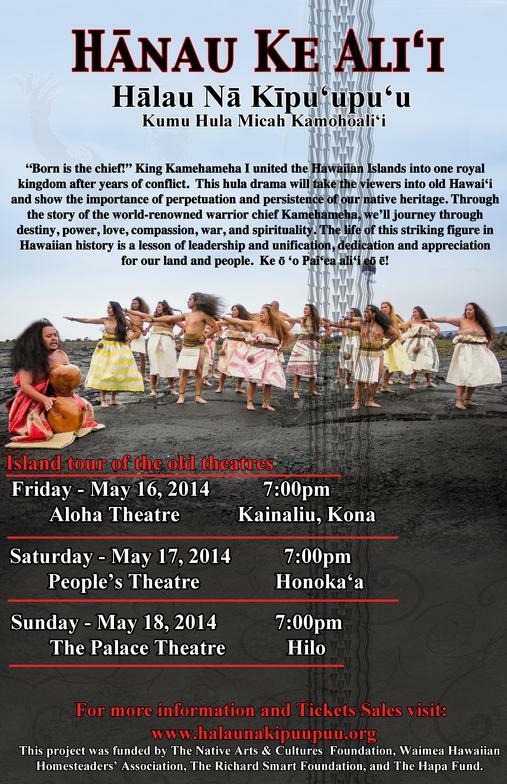 Through the story of the world-renowned warrior chief Kamehameha, we’ll journey through destiny, power, love, compassion, war, and spirituality. The life of this striking figure in Hawaiian history is a lesson of leadership and unification, dedication and appreciation for our land and people. 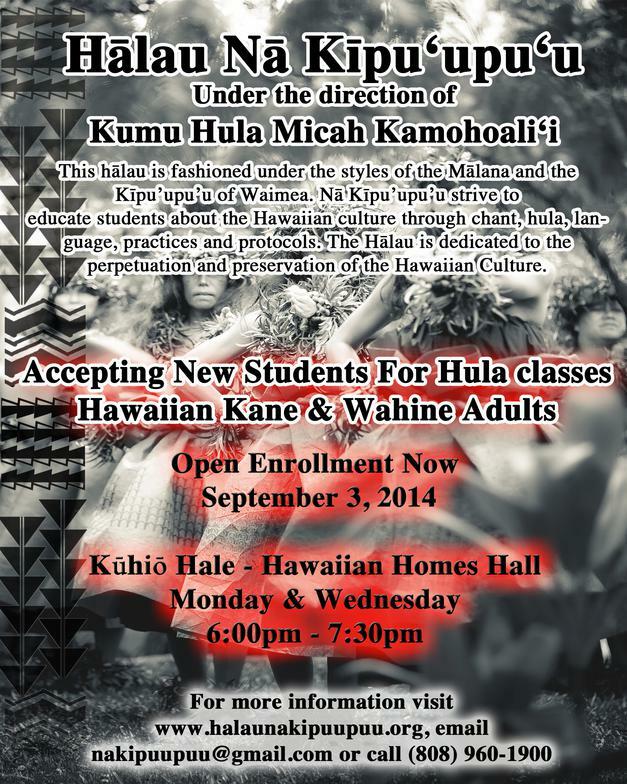 Ke ō ʻo Paiʻea aliʻi eō ē! 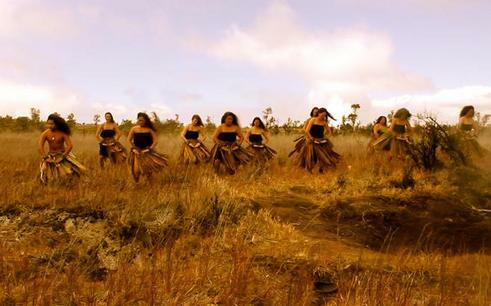 Hālau Nā Kīpuʻupuʻu performed at Hawaiʻiʻs Volcano National Park upon the Hula Pā. 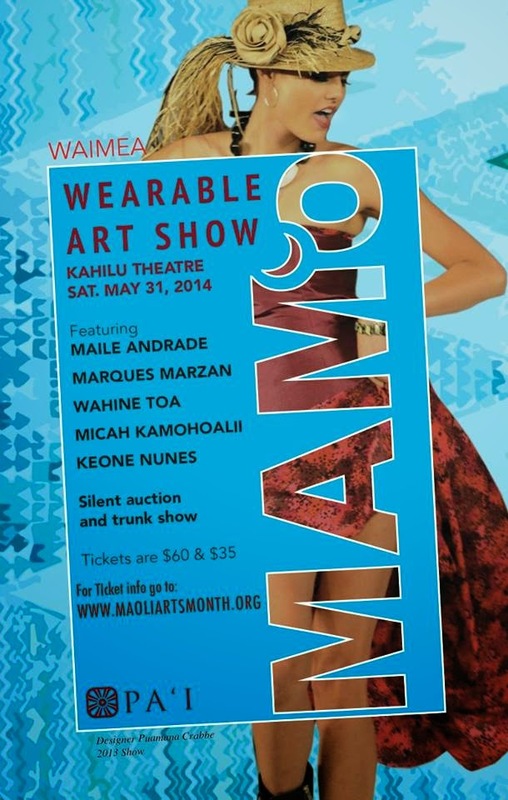 The Wearable Art Shows at 3 different venues (See Event Listing for each show) will feature cultural practitioners and artists showcasing art that native Hawaiians wear for ceremonial rituals, cultural practices and adornments. Both traditional and contemporary garments will be included, for example: kapa, feather work, shell jewelry, tattoo, weaponry, weaving, carving, traditional Hawaiian musical instruments and many more. 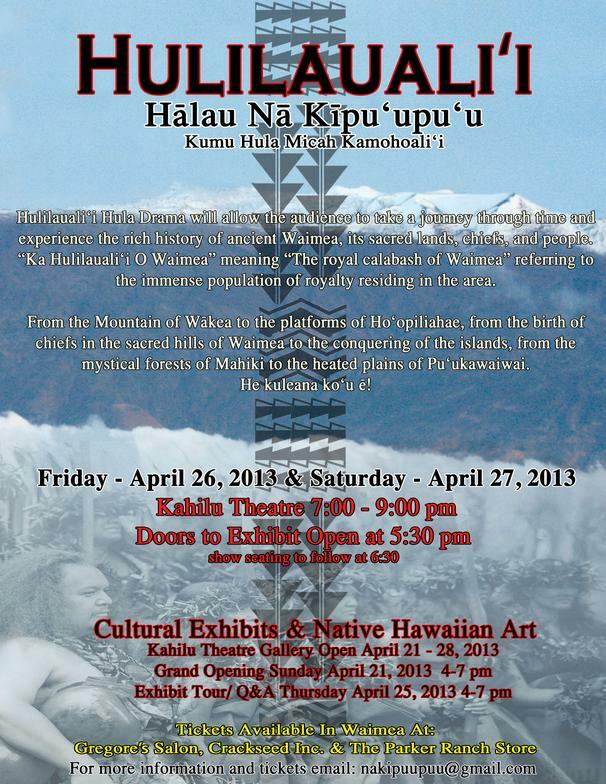 The show will incorporate Hawaiian performing arts into an evening of art and entertainment. Revenue earned from this event will be used to fund future MAMo events. Afin de faire honneur à cette 1ère visite à Paris, Kumu Micah proposera aux stagiaires des chorégraphies sur le thème des Ali’i qui sont allés en Europe ou des chants classiques du répertoire de musique française. Nous n'en dirons pas plus à ce stade, vous aurez la surprise en live! 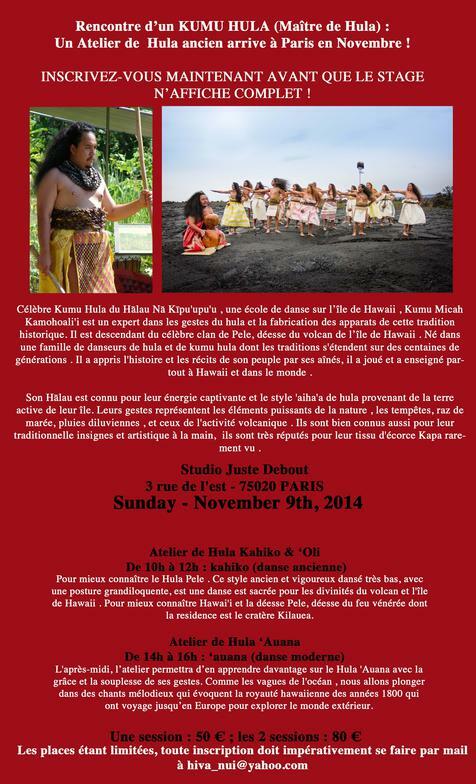 Les places étant limitées, toute inscription doit impérativement se faire par mail à hiva_nui@yahoo.com. 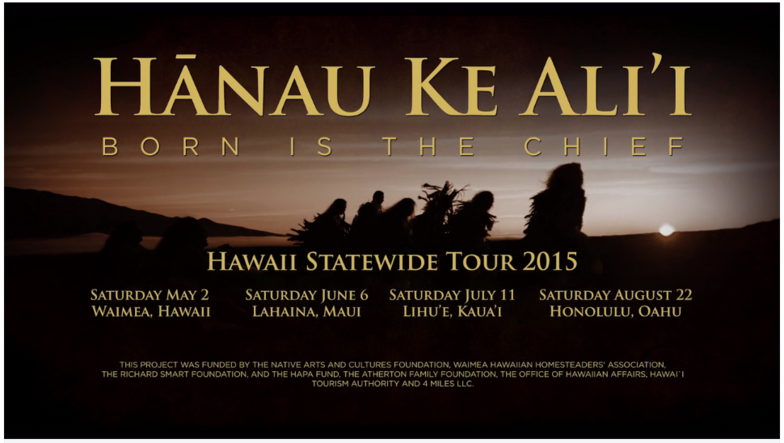 Hālau Nā Kīpuʻupuʻu tours Hānau Ke Aliʻi Hula Drama in the State of Hawaiʻi. They will be dancing on all 8 island of the Hawaiian island chain, conquering like Kamehameha!